Things are going to get crazy the next couple of weeks. We're going to Nashville to pick up Adrian on Friday. She'll be here the next 2 Mondays. I'm working hard today to type up the posts so I can still share some pieces with you. I made good use of the VSN challenges earlier this month. One of the challenges was to create a Sympathy card. We don't like to think of ever having to need them but they are a part of life. I just keep reminding myself this is my way of hopefully giving comfort to someone in great pain. 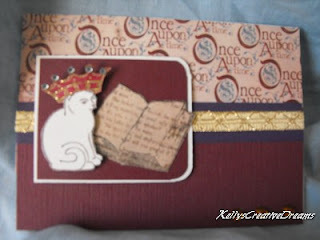 I chose a design by Keri Lee Sereika in the Oct. 2009 issue of Crafts 'n Things magazine. She showcased three beautiful cards inspired by supplies she had on hand. That's what I encourage the S2S group on SCS to do all the time. Don't buy more until you've made use of what you have. And if you are going to buy new, will you really use it? Or will it be added to the stash of 'someday' projects? Keri used a lighthouse stamp from Scene It! Beacon of Hope by Cornish Heritage Farms Her card, entitled Never give up hope used a beautiful lavender-swirl paisley paper and a plum cardstock from Prism Papers. Following Keri's concept of 'use what you have', I went to my DCWV Old World slab. I chose the blue nautical print and paired it with SU Marina Mist. For my image, I chose the Garden Collage from SU and stamped it in Marina Mist. Two pearls seemed like the perfect accent with this image and sentiment. This was a simple layout but sometimes, simple is the best and when you need a card last minute, it's nice to know beauty and simplicity can pair nicely to bring comfort to someone else. Until I got out of bed this morning, I didn't think this post would happen. We've been told for days to expect strong thunderstorms today and tomorrow with added rain through Thursday. All of this meant no computer for most of the week. Agh! Imagine my delight when I woke up to no rain or storms. The skies are a bit overcast and the temperature about fifteen degrees cooler than past mornings. But it was pleasant while I was out filling the bird feeders and saying good morning to my dogs. With tomorrow being the first day of spring and Big Bird's Birthday, I thought I'd show you one of the birthday cards I made for VSN this month. The challenge was to showcase spring. I found a 5-step card by Designer Lana Lepinski called Within Your Heart in the April/ May 2006 issue of Paper Crafts magazine. 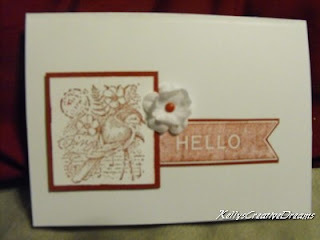 Lana used Stampin' Up product layering Always Artichoke on Mellow Moss. She did a running stitch border. Then she tore the right edge of a Bordering Blue and Whisper White cardstocks, layering the white on the blue and adhered them to the stitched mat. To the left side of the white, she stamped flowers from SU Fresh Fields in Mellow Moss (leaves) and Bordering blue (flowers). She stamped the Dreams sentiment in Basic Black to the right of the flowers. For an accent, she added a rustic wooden button with linen thread centered over the sentiment. I thought that quote would also work well as a Sympathy card. Here is my interpretation of Lana's card. I made two of these. One using Bashful Blue and the other Pink Pirouette. The butterfly is by Co-Motion. I stamped it in the Bashful Blue then brushed it with Iridescent Stickles to catch the sunlight as it flies. The antennae are highlighted with the black Glaze pen. I have a couple of options for tomorrow's Teapot Tuesday card. I started deep cleaning the office side of The Studio last week and my work table is still a bit cluttered. The other thing will be determined by the weather. Let's cross our fingers I get to stop in. I took yesterday off to go into the city for the day. A long day which began with getting on the road by 8 a.m. and pulling back into my driveway a bit before 10 p.m. It was a relaxing day. I did some snooping, some shopping, enjoyed lunch with my sister and browsed mixed-media books at Barnes & Noble. I started off heading for Ava, MO. 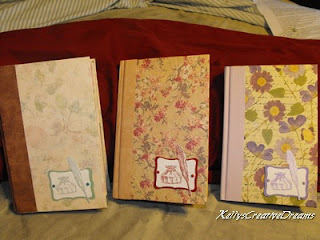 Remember the blog hop I went on last fall? Dogwood Quilting is where I won the $50 gift certificate. I knew I wanted the solid cotton fabric for the sashing and backing for the butterfly quilt made from reproduction fabrics. We couldn't find a thing that worked! She had very limited supply of the solid cottons. Connie said she seldom has a request for them. Okay... plan B. I see a book for projects using the paint sticks. I've been wanting these but not enough to spend $35+ plus for a 5-pack. Guess what? They were sold out. So much for Plan B.
I did manage to find two quilting books I couldn't live without. One was the Pioneer Sampler by Eleanor Burns. I've recorded the series off of RFD-TV but wanted the book for a more detailed cutting instruction. I also picked up Burgoyne Surrounded - A Classic Quilt Plus Six Variations by Elizabeth Hamby Carlson. Once I got to Springfield, I went to Hobby Lobby, Michaels and JoAnns. I found the perfect fabric for the sashing/ backing. I thought it was on sale. Turned out it wasn't, but it was a better price than I'd have found in another quilt store and exactly the color I wanted... a pale mint green. I also took advantage of paper being on sale. Slabs and individual sheets were 40% off and I had a coupon for an additional 20% off. I was disappointed they only had a couple of the new DCWV slabs in... and not the ones I wanted. 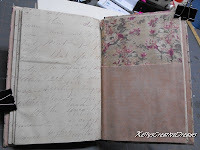 I did buy a solid slab to use with one of my others for a DCWV scrapbook layout competition I'm hoping to enter this month. It dawned on me I probably didn't want to use SU cardstock for the layout hehe. At Hobby Lobby, I picked up a package of the CB border folders with a coupon and they had the Paper Studio ribbon spools 50% off. Yeah, had to pick up 10 of those :-) You know, like I needed more ribbon! I've wavered back and forth about the CB border folders until I saw a card recently where the border folder was used to create a separate mat - not for embossing the edge of the card. It was one of those DUH! moments for me. I didn't find a single thing at Michaels. That store was a disaster! They didn't have hardly any Easter crafting supplies and I really wanted paper mache eggs to do a project with Adrian while she's here. What 4-year - old doesn't like to tear paper and glue! The $1 tower baskets along the front of the store were empty and they didn't have a single new slab of the DCWV. I was so frustrated, I didn't even bother going back to the art department. I do know that for all the 'bad scores' the Peoria Michaels store ever got, our store NEVER looked like this one. I'm not even sure it's worth going back. I can always use an overnight in Paducah where the store is clean, well stocked and friendly staff. After early dinner at Red Lobster for Lobsterfest with my sissy, I spent an enjoyable hour at Barnes and Noble browsing mixed media books. There were several new ones but I came home with only a Texas magazine and a wood tick! Yep, a tick. Thank you B & N! I have a bunch of writing stuff due over the next couple weeks so I'm going to force myself out of the studio to get those projects out of the way. So for the next couple of weeks, probably the only posts will be the Magazine Monday. But I'll pop in to keep you updated on progress. I had a really good weekend. I hope you did too. I spent the entire day on Saturday working on some of the challenges from the SplitcoastStampers VSN that was held on Friday night and all day Saturday. When I participated in the VSN back in December, I focused on Christmas cards, using the challenges as my guide to get all of my 2012 Christmas cards done. It worked out very well. Each time I opened up a challenge, I figured out what I wanted to do, used a Christmas theme (unless the challenge called for a specific theme) then cut enough of everything to do 10-12 cards of that one challenge. This time my focus was on Birthday cards. One of the threads I co-mod on SCS is a monthly reminder thread to get our birthday/ anniversary cards out on time. Because I’ve been busy playing catch-up on the business, I haven’t been getting my cards out like I wanted. So I decided I needed to get some of these cards done up ahead of time. 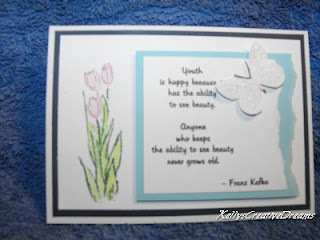 I found this birthday card inspiration in the 4th quarter 2011 issue of STAMPING-STATIONARY-AND-SCRAPBOOKING, an idea magazine from Hobby Lobby. For $1.99 you get a ton of great ideas for card and scrapbook page layouts. This particular card was under Thanksgiving – not a birthday card. It was a Happy Thanksgiving design by Regina Farrell of TX. I tried doing a search for her without success. I kept her sketch pretty much the same. Where I have 2 sunflowers, she used 2 pumpkins, accented with a couple of green oak leaves. Where I used the Vintage Labels, Regina used an actual tag with Happy Thanksgiving stamped on it, a bit of chocolate ribbon tied in a bow on the tag and a brown oak leaf. Across the bottom of the printed band, she added a row of the brown oak leaves. I tried just using the sun ‘flowers’ but decided they really needed the stems/ leaves. 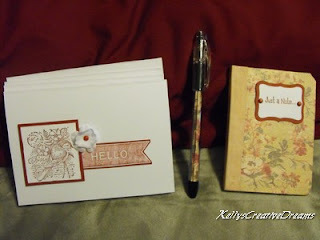 I used the Marvy Daisy punch for the flowers and the SU Build A Blossom stamp set for the leaves. The green stripe is from a 2-sided paper by Heidi Grace Designs called Baby Girl. In trying to use up stash, I’m using my ValuCS on cards I know will probably be tossed after receiving so I used ValuCS Yellow and Green from their Primary collection as well as SU Garden Green. I used my favorite SU Vintage Labels for the sentiment. 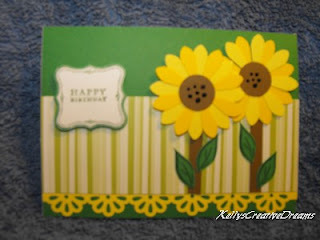 The MS Daisy border punch gave a nice country look to this card in keeping with the sunflowers. I FINALLY have a post for Recycle Wednesday. It's not what I've had in my mind initially but it definitely fits. I have a passion for Altered Art. I love taking something and repurposing it. And one of my favorite things to repurpose is a book. As a writer, I value the 'book in my hands', 'turn the pages', kind of thing. However, I am also wise enough to understand that as technology continues to advance, a lot more books are going to wind up in landfills. Sad, but true. 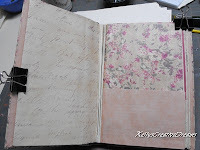 I have 3 or 4 different 'Altered Books' in progress. Little by little I'll get them finished. In the coming weeks, as my creative time is shared with my granddaughter, I'll be posting some of my past completed projects. Over the past couple of months, I've been working on a Stationary Swap over at SCS. My SCS friend, Susan always comes up with the neatest swaps! Being a hostess has a bonus! We work them as a 3 + 1... meaning everyone who signs up makes a total of 4. 3 will be swapped out amongst the other participants and 1 is for the hostess. She gets the goodies without having to create. Trust me, she has enough of a job coordinating the swap. She EARNS the goodies she receives in return. * And we HAD to including stamping in some way. Anything else we wanted to add, such as a notebook/ address book/ notepads/ stickers, etc were optional. they were back ordered until the end of April! The swap was due to be in Susan's hands by March 1st. Okay... new plan. The following weekend I was in the city and spent a lazy afternoon at Barnes n Noble perusing the mixed media art books when I came across an altered hardback book with pockets. BINGO! Because I had to make four of these, I picked up 8 books (always nice to have extras on hand, right?) from my local library sales room for 25 cents each. They were each approximately 6" X 8.5". I plan to write a tutorial on this soon so I can't show the step by step, just the end results. But I will give you a brief overview of what I did. Here is a picture of the three different covers. I used SU Sage Shadow to complement the soft florals in the first one, Cherry Cobbler in the 2nd one and Almost Amethyst in the 3rd one. I made two of the second design as I had purchased the most of that print. I must have really liked it. After determining the placement of the items I needed to include and how much space would be needed between the pages, I cut out the excess book pages. They'll be great for punched flowers and other mixed media projects in the future. I used this pocket for the 4 cards and this one to hold the envelopes. I did 4 cards and lined the envelopes to coordinate with each album's color scheme. 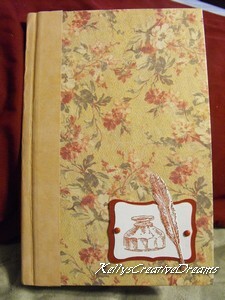 I also covered a mini-composition book to match the cover of the stationary keeper. 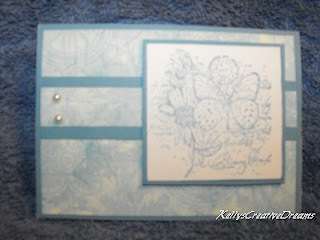 This particular set was done using SU Cherry Cobbler as the coordinating cardstock to The Paper Studios Mirabella Floral DP I purchased at JoAnns. The spine cover is Tan Leather by Paper Pizzazz. My tip for this week... never judge a book by it's cover. It truly is what's inside that counts! Today we are taking the royal carriage to Austin TX and the home of Virginia Blakley. Virginia recently broke the femur bone just below her hip. Not fun! Virginia loves history and has read everything on Queen Elizabeth. So our challenge for TPT this week was to bring a touch of royalty and books to Virginia. As a bonus, she loves cats but can't have one because her husband is allergic. So if we included a royal feline, all the better! Virginia is also uber special because she is the mother of one of the kindest souls on SplitcoastStampers. Lydia, aka Understandblue, is one of the forum mods and is usually right on top of fixing any problems we might have or directing us when we're not sure we've done something correctly. Though she is not the only mod over there, she is the one I work with most often and adore her. As soon as I read the challenge details, I knew I had to use my DCWV Once Upon A Time stack. The colors and the theme were perfect for this challenge. 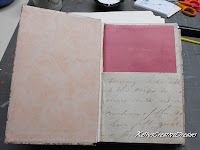 I paired the paper with SU Bravo Burgandy and Very Vanilla. The cat is from Paper Crafts. I inked the stamp with Memento Tuxedo Black and then over-inked it slightly with SU Bravo Burgandy. I can't remember the stamp company I got the book stamp from. I used MTB to stamp over a section of the 'story' paper in the DCWV slab then cut it out. To break up the pairing of DP/ solid CS, I used a strip of SU Elegant Eggplant to pull out the script from the DP. Then I found this rich -looking gold trim in my fiber stash. Perfect! To finish it off, I cut the crown from a background sheet of the same CWV slab and added jewels to the crown points. I cut a slit and so Her Royal Kitty could wear her crown properly. I hope Virginia enjoys this card as much as I did creating it for her. Today's card is a take on a card by Carolyn King. 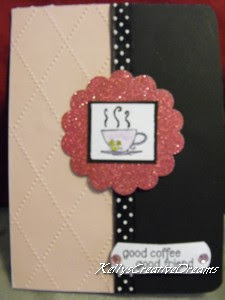 I found the card as part of her collection of coffee/tea themed cards in the February 2008 issue of Crafts n Things magazine (pg118-119). ner paper. To bring the 2 sections together, she created a band by layering a floral dp on chocolate chip, using it as a wide ribbon. She then centered a Chocolate Chip scalloped circle, matted with Old Olive then a coordinating DP circle. In the center of the circle she matted her stamped image on square mats. I chose to flip things a bit, using items from the swap kit. I turned everything vertical and eliminated the multiple layers. Everything except the sentiment (Studio G) came from the kit. The cup is from SU Morning Cup. I'll try to get my behind out of bed earlier in the morning and have the Teapot Tuesday card posted at the beginning of the day. By now ya'll know my absolute favorite DP to work with is DCWV. Their paper slabs are so rich, well-coordinated themes you just can't help but flip through a slab while your creative brains spins wildly with the unlimited possibilities. 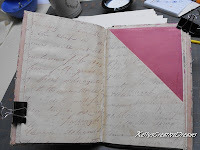 Last week I discovered their blog, DCWV Diary. WOW! They have been featuring the new slabs in both their namesake - DCWV slabs and their 'undercover' line, RECOLLECTIONS (found at Michaels). Today marks the release of their AWESOME spring slabs hitting Michaels shelves. Check out THIS YouTube video to see them up close. My favorite is the Garden Tea Party. Today's post on their blog showcases the Top 10 of their February Sketch Challenge, as well as revealing the winner. I love the diversity of the take on the sketch. Incidently, they got their sketch from Sketch Savvy This is the 2nd time TODAY, I've been directed to Susan's blog so I had to check it out. She has some great stuff over there. Lots of cool inspiration. I hope you take a couple minutes to check it out while you're cruising.